What if the Bible’s teachings about Creation, the Flood, and a young Earth—what we teach at Apologetics Press—could be released in hundreds of movie theaters nationwide, in an extremely professional, modern video production, and presented in an eloquent way by the leading Creation field scientists? Would such a movie be worth supporting? We wholeheartedly believe so. To our knowledge, never before in history has the truth of Creation, the Flood, and a young Earth been presented in such a sweeping venue and in such an impressive way—a way that has the potential to give credibility to the biblical view of origins in the minds of millions of Americans who have heard little about the truth. Most, of course, have only heard the “other side,” while being told that the Creation/Flood model is unscientific, evidence-less, and riddled with error. By the grace of God, I have had the opportunity over the last few years to work in the field and attend conferences with several of the scientists who were interviewed in the film to see firsthand the legitimacy of their work. We at AP had the opportunity to preview the film…and offer thoughts and suggestions (many of which were implemented in the film). Although the film (like Fireproof, Courageous, etc.) was not produced by churches of Christ (with whom we are affiliated), very little within the film would we find objectionable. If there was ever a movie Christians should support in movie theaters, in our opinion, this is it! Mark your calendars for this Thursday and save a little spending money to go support this extremely timely and worthwhile film. Send a message to movie producers and the evolutionary community that the Creation model is not an antiquated, hokey view held by a small number of irrelevant, negligible, fringe radicals, but a valid, powerful, competitive alternative (to mainstream naturalistic science), which squares with the evidence and, hence, should be given attention in science classrooms and textbooks. Keep in mind that tickets are limited! Get yours today. 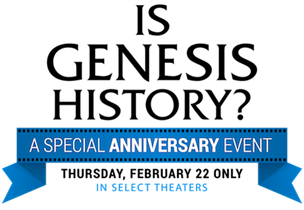 For more information, visit: https://isgenesishistory.com/anniversary/. Copyright © 2018 Apologetics Press, Inc. All rights reserved. We are happy to grant permission for this item to be reproduced in its entirety, as long as the following stipulations are observed: (1) Apologetics Press must be designated as the original publisher; (2) the specific Apologetics Press Web site URL must be noted; (3) the author’s name must remain attached to the materials; (4) textual alterations of any kind are strictly forbidden; (5) Some illustrations (e.g., photographs, charts, graphics, etc.) are not the intellectual property of Apologetics Press and as such cannot be reproduced from our site without consent from the person or organization that maintains those intellectual rights; (6) serialization of written material (e.g., running an article in several parts) is permitted, as long as the whole of the material is made available, without editing, in a reasonable length of time; (7) articles, excepting brief quotations, may not be offered for sale or included in items offered for sale; and (8) articles may be reproduced in electronic form for posting on Web sites pending they are not edited or altered from their original content and that credit is given to Apologetics Press, including the web location from which the articles were taken.